I have been on a quite a few online email lists over the last 7 years or so, basically since they first came out. From the original Jeep-L list to the XJ-list to the Rockcrawler.com board, a common question comes up time and time again. No, I’m not talking about “how big a tire can I fit” or “which tire is better.” I’ll save those questions for the opinion section of everyone else’s website. I’m referring to the age-old question of “which fastener grade should I use?” It seems that everyone has an opinion on which grade is better but not many people can or will tell you why. Well, I’d like to explain the technical difference between a SAE Grade 8 (Grade 8) and a SAE Grade 5 (Grade 5) fastener. Most people think a bolt is a bolt is a bolt. They see it as a machined chunk of metal that holds or attaches things. Fasteners (aka bolts or screws) are complex mechanically-engineered hardware. They are made using different materials, different thread types (i.e. coarse, fine, extra fine), various lengths, with grip or no grip (shank), different types (i.e. hex, 12 pt, carriage, etc. ), different coatings (i.e. passivated, cadmium, dry film lube, etc. ), various classes of fit (i.e. class 3), and multiple grades (i.e. grade 5, 8, etc.). Bolts come with left or right hand threads, metric or SAE threads, different number of threads per inch (i.e. 20 or 28 for the same size fastener) and various versions of those (i.e. UNF versus UNJF). In addition, there are way too many military specs in existence to list them all here. So with all these differences, it’s no wonder most people don’t understand the difference between fasteners very well. Of all these differences, I’ll focus on the different grades since that is what most shade tree mechanics ask about. First, you need to be able to identify bolts by the different grades when you go to the local hardware store. Grade 5 bolts have 3 marks or lines on the head that are in theshape of a “Y”. Grade 8 bolts have 6 marks on the head. Second, the different grades have a meaning to them. It tells you how strong the fastener is. There are different types of strengths listed for each grade. Proof strength(about 90% of yield), ultimate tensile strength (bolt fails in stretch), yield strength (bolt begins to get a permanent set and changes cross-sectional area typically) and shear strength (bolt prevents parts from separating by using it’s shank or body as a stop). Depending on how you are using the fastener, you would look at the appropriate and corresponding strength type. For example, bolts that attach a D-ring bracket to the bumper face of a vehicle would be critical in tension . So you would want to know what the tensile strength a particular bolt is. Bolts that attach winch-mounting plates are typically seeing mostly shear loads thus preventing the winch from departing from the vehicle during winching operations. In that case, shear strength is important to you. Mark’s Standard Handbook for Mechanical Engineers lists Grade 5 fasteners as 120 ksi fasteners. This means the tensile strength is 120,000 lbs per square inch. It also lists Grade 8’s as 150 ksi fasteners meaning the tensile strength is 150,000 lbs per square inch. Also, the ultimate shear strength of a fastener is typically about 60% of its ultimate tension strength. So given a certain diameter (cross-sectional area) andstrength rating, someone can figure out how much load that fastener can carry in both tension and shear. Let’s look at an example of where grade 5 and grade 8 bolts are subjected to single shear loads (winch plate reference). That’s a difference of over 750 lbs or over 1/3 ton. In this example you can clearly see that using a grade 8 fastener has a superior advantage over the grade 5. 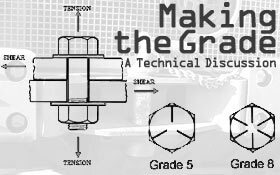 Therefore the result is if someone is using grade 5 bolts in a shear application like the winch plate example, they will fail almost 800 lbs earlier. I’ve also heard the argument that grade 8’s are more brittle than grade 5’s and that’s why you shouldn’t use them. Well, first you need to understand what the term “brittle” really means. Brittleness in bolts is defined as failure at stresses apparently below the strength of the bolt material with little or no evidence of plastic deformation. Typically, fasteners are not brittle below 180 ksi ultimate tensile strength. Grade 5’s have an ultimate tensile strength of 120 ksi and a grade 8 fastener has an ultimate tensile strength of 150 ksi. This is why brittle is a relative term. Nearly all fasteners are considered ductile except some made from PH 15-6 Mo, 17-4 PH and 17-7 PH. Again, you can see that the grade 8 will support over 1000 lbs more or a 1/2-ton more. But there’s something more important to note. The grade 5 fastener has already reached its ultimate load and FAILED BEFORE the grade 8 starts to yield or stretch. Therefore, the argument that you should not use grade 8’s because they are more brittle than grade 5’s is not a true statement in most applications. Toughness is an important feature of a fastener. It is the opposite of brittleness and gives you an idea of how it will handle abuse without being damaged and eventually weakening the fastener or can cause fatigue to appear much earlier than normal. One way to “measure” toughness is by looking at the hardness rating of a fastener. The higher the number (Brinell, Rockwell …) the harder the material is and the tougher it is to damage. According to Marks’ Standard Handbook for Mechanical Engineers, Grade 5’s typically have a core Rockwell hardness of C25-C34 whereas a grade 8 typically has a core Rockwell hardness of C33-C39. Based on this, grade 8’s are tougher than grade 5’s. Fatigue usually doesn’t play a big part in grade 8 or grade 5 fasteners since most steels are good for 2 million to 10 million cycles. Far more than you will ever winch or pull on. Here is a quick point about fastener fatigue. Almost all fastener fatigue failures are the result of improper (almost always too low) torque. Too low a torque will cause the fastener to pick up more load more often and eventually cycle it to failure. Therefore, you want to make sure you torque your fasteners to the appropriate level using a torque wrench and make sure to torque dry, clean threads. Lubricated threads significantly change the actual preload on the fastener and you risk over torquing it. Due to space and time limitations, here is a chart showing you the tension and shear minimum capabilities of different grade fasteners relative to their size. These examples show how much of a load can be carried by the fastener BUT you need to make sure the parent material is strong enough to handle the loads, as well, otherwise it will fail. Industry practice is to apply a safety factor to address any unknowns and/or combined load cases to give you an adequate margin of safety. Another good point to make is to never reuse fasteners after they have been subjected to loading or the elements. Corrosion can cause a fastener to fail well below its initial strength. So be smart and use only new fasteners when installing or reinstalling some cool new widget on your rig. Getting back to the original question, “which fastener grade should I use?” I hope it’s very clear by now that grade 8 fasteners are far superior to grade 5 fasteners. If this is so, then why do the automotive manufacturers use some grade 5 fasteners? The automotive OEM’s use what it needs to be safe and nothing more since there is a difference in cost between grade 5 and grade 8 (or metric 8.8 and 10.9). Since the OEM’s manufacture millions of vehicles each year, the difference in a few cents per fastener adds up to a lot for them. However, as an individual who has spent some serious coin on a winch or lift kit, I wouldn’t let the few cents difference in the cost of a grade 8 versus a grade 5 fastener make up my mind as to which fastener I would use. We have a saying where I work that seems an appropriate answer to this age-old question.